The director of the Southern California Earthquake Center, Thomas Jordan, made an announcement recently that would have sent a chill down the spine of every Californian: that the San Andreas fault appears to be in a critical state and as such, could generate a large earthquake imminently. Of course, the reiteration of the seismic hazard to Californians will be nothing surprising, but what is new is the warning that the southern portion of the fault “looks like it’s locked, loaded and ready to go”. Why is this eminent seismologist making these alarming statements? 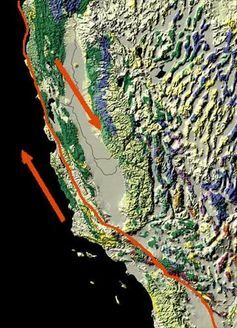 Well, the fact is that there has not been a major release of stresses in the southern portion of the San Andreas fault system since 1857. In simple terms, the San Andreas is one of many fault systems roughly marking the border between the Pacific and North American tectonic plates. Both plates are moving in an approximately northerly direction but the Pacific plate is moving faster than its North American counterpart, meaning that stresses between the plates are constantly building up. In 1906, some of these stresses were catastrophically released in the San Francisco Bay area in a 7.8 magnitude event and again, in northern California, during the 6.9 magnitude 1989 Loma Prieta earthquake. Events of these magnitudes, however, have not occurred along the San Andreas fault in the south of the state – the 1994 Northridge event was associated with a nearby, but separate, fault system – leading to the suggestion that one is imminent and, given the amount of stress that might actually have accumulated, when it arrives it will be the “Big One”. So just how big could this potential earthquake be and is it possible that the destruction demonstrated in the film San Andreas could actually come to fruition? In short, Californians will be (reasonably) pleased with the answers to these questions. 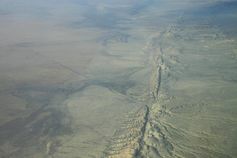 In the film, the San Andreas fault produces an earthquake with a magnitude of 9.0. While not unheard of globally, earthquakes of this size are generally confined to regions of the earth where subduction – where one tectonic plate is being forced below another – is happening, for example in Chile and Japan. The tectonic situation in California is different. Here, two plates are sliding past each other. As such, recent predictions limit the possible maximum earthquake magnitude along the San Andreas fault system to 8.0, although with a 7% probability estimate that such an event could occur in Southern California in the next 30 years; over the same period, there is a 75% chance of a magnitude 7.0 event. While magnitudes of 7.0, 8.0 and 9.0 might sound negligibly different, the energy that such events would unleash varies significantly, with a magnitude 9.0 event releasing 32 times more energy than a magnitude 8.0 and 1,000 times more energy than a magnitude 7.0. Obviously, however, be it a 7.0 or an 8.0, damage is inevitable, but the whole sequence of events, as depicted in the film, is unlikely. For example, the San Andreas fault is not beneath the ocean and as such, any slippage along it could not displace water to the extent that a tsunami would be generated. The opening up of a massive chasm is also from the la nd of fantasy, as the plates are sliding relative to each other, not away from each other. What is realistic, however, is that a great amount of destruction is likely. While the building codes in California are stringent, recommending retrofitting of seismic protection measures to older buildings and preventing the construction of new buildings near to known fault lines, there is no way to make a building 100% safe. In an attempt to understand the effects of a large, southern San Andreas earthquake, the U.S. Geological Survey modelled a 7.8 magnitude event, with slippage of 2-7 metres, to represent the stresses that have built up in the area since the last large event. From this model, it was found that damage would be most severe to constructions straddling the fault. Fortunately, constructions of this sort are few and far between following the 1972 Alquist-Priolo Earthquake Fault Zoning Act. What would be affected by this slippage, however, are the 966 roads, 90 fibre optic cables, 39 gas pipes and 141 power lines that cross the fault zone. The total cost of damage to buildings was estimated at $33 billion, with modern buildings faring well but older buildings being particularly susceptible. Fires would rage – as they did following the Northridge earthquake – as gas mains, and mains water pipes, become severed; in fact, the damage from resulting fires is estimated as more costly than that resulting from the initial shaking. The overall death toll is estimated at 1,800. And just when things don’t look like they can get any worse, the main event will have destabilised the tectonics of the region to such an extent that a series of potentially powerful aftershocks will begin. 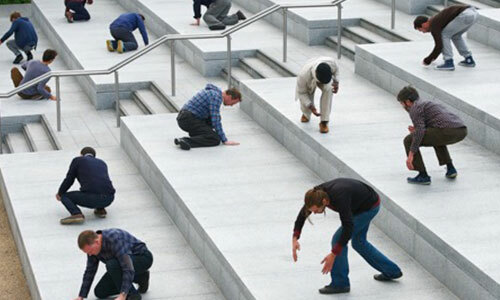 For example, in 2011, Christchurch, New Zealand was struck by a 6.2 magnitude event and since then the city and surrounding region have experienced more than 10,000 aftershocks. Fortunately, the film San Andreas is pure fiction, featuring the levels of exaggeration we are all used to from film makers who are, ironically, also based in southern California. Even so, in all probability, the San Andreas is likely to generate a significant earthquake in the not too distant future. When it arrives, the damage will be significant and southern California will be massively affected. But Californians are no strangers to these events and the infrastructure of the state, in recent times, has been designed with earthquake protection in mind. Forget tsunamis and deep chasms opening up, but do expect violent shaking, building damage, fires and widespread economic impacts as the region is out of action for potentially a long period of time.